Rapids and rocky shoals, once impediments to river travel, were instrumental in the development of South Carolina's Fall Line cities. When early explorers first sailed upriver from the Carolina coast, they eventually got to a point where the rivers were no longer navigable because of rapids or rocky shoals. These impediments weren't just rocks in the river though; they marked the Atlantic Seaboard Fall Line, sometimes called the Fall Zone, a nine hundred-mile-long escarpment that begins in New Jersey and continues southwest through Georgia. In South Carolina the Fall Line runs roughly parallel to U.S. Highway 1, dividing the state geologically and geographically. According to Greg Kuntz, a senior hydrogeologist with Schnabel Engineering in Columbia, "the Fall Line in South Carolina represents an imaginary line on the surface where the hard crystalline rock of the piedmont meets the softer sedimentary formations of the coastal plain." Kuntz goes on to explain that the formation of the Fall Line may be attributable to plate tectonics - movement or shifting of plates deep within the earth's crust, though the issue is a complicated one, geologically speaking. Scientists don't yet know with one-hundred percent certainty how all of these geologic forces combined to create the topography we know today. Scott Howard, chief geologist with the S.C. Department of Natural Resources' Land, Water and Conservation Division, surmises that faulting or deep fracturing may have played an important role in the relative position of the Fall Line. "At the Fall Line, the crystalline rocks take a precipitous drop in slope," says Howard, explaining that the harder rocks can be found deeper underground as one moves east of the Fall Line. "At Charleston, the crystalline deposits may be several thousand feet deep." According to Kuntz, the development of South Carolina's coastal plain was controlled by the rise and fall of ancient sea levels, leaving broad and relatively flat terraces on primarily unconsolidated sediments east of the Fall Line. West of the Fall Line, in the piedmont and the mountains, hard crystalline rocks are often exposed over hilly or even mountainous terrain. "The Fall Line is most easily observable within the major coastal plain rivers at the point where they cease to be navigable," says Kuntz. So the Fall Line appears to be a dividing line, and geologically it is just that, but geology is only one part of the story. The Fall Line also represents a region of cultural exchange and a stopping point for early travelers moving east or west. On the Congaree River, it also marks the location of Columbia, our state capital. Other Fall Line cities in South Carolina include Cheraw, Camden and North Augusta, but Columbia's location along the Congaree provides perhaps the best example in the Palmetto State of the successes and surprises of "Fall Line cities." In Colonial times, agriculture in South Carolina existed mostly along the coast, because planters needed an efficient way to transport crops, such as rice, indigo and cotton, to Charleston for sale or export. As the colonies expanded westward, planters in the coastal plain depended on the rivers to get their crops to market, and as more people moved to South Carolina, a new breed of backcountry planters in the piedmont sought ways to portage around the rocks at the Fall Line. In the 1820s, a waterway building boom took place in the Atlantic states, as canals were built to connect river systems and portage around rapids. Fall Line cities like Columbia grew and developed at these key points for commerce. There were many canals built in the Columbia area on the Saluda, Broad and Congaree rivers, and at one time as many as 66,500 bales of cotton passed through the Columbia Canal on the long journey to Charleston in one year, according to Historic Columbia Director of Properties and Interpretation John Sherrer. From historic documents collected by the American Canal Society and the National Park Service's National Register of Historic Places, we know the original 1824 Columbia Canal was roughly three miles long and stretched from Granby to the confluence of the Saluda and Broad rivers, connecting to canals portaging goods down the Saluda River. Remnants of the original Columbia Canal can still be seen along the Columbia River Walk behind the University of South Carolina's baseball stadium. That canal was just four feet deep and only fifteen feet wide. Locks were employed to raise or lower barges as much as thirty feet over the entire span of the canal. Brick and stone remnants of at least one of those locks still can be seen in the river. The canal was briefly successful, but when railroads came to South Carolina, the canal (and river transport of goods generally) was quickly abandoned. 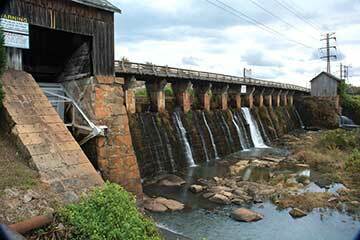 The swift waters along the Saluda and Congaree at the Fall Line also powered grist mills, and the old Saluda Factory water-powered textile mill, which was burned during Sherman's advance on Columbia in 1865. Those ruins can still be seen within the Riverbanks Zoo and Botanical Gardens. After Reconstruction, renewed interest in using canals to turn generators for producing electricity prompted the Columbia Canal Board of Trustees to redevelop a portion of the upper Columbia Canal and extend it up the Broad River. Once completed, the new canal measured more than three miles in length. It was 150 feet wide at the surface and 10 feet deep. The canal generated the electricity that powered the Columbia Mills textile mill, now the site of the South Carolina State Museum. Today, this canal is incorporated into the city's Three Rivers Greenway. Excellent walking trails span its entire length, and many of the old power plant buildings make the park not only a scenic green space for local citizens to enjoy, but also a historically significant treasure. 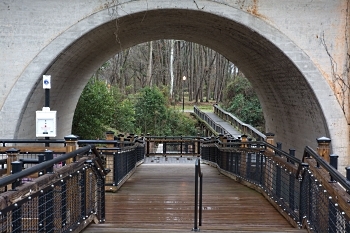 The walking trail offers views of the Saluda and Broad rivers' rocky confluence. Above the confluence, near the I-26 bridge, you may even see endangered rocky shoals spiderlilies holding their heads above the waters each May. Still, that's only part of the Fall Line story. Although the Fall Line has been defined both geologically and historically as a dividing point between regions, recently a group of forward-thinking historians began pursuing a project that might redefine the Fall Line as a place of merging cultures where art, craft and recreation may be the driving factors in computing the Fall Line's economic impact on this region. In 2002, a new partnership between several museums formed the Fall Line Consortium to identify and interpret cultural artifacts from South Carolina's Fall Line region. According to John Sherrer, while the area around the river confluence and Fall Line has historically been a natural attraction for both recreation and industry, Sherrer and many of his colleagues believe that the Fall Line region also developed a specific identity in its material culture, or the objects and architecture produced by the people in the region. "One of the [most well-known] expressions of material culture from this area is Edgefield pottery," says Sherrer. "Alkaline glazed ceramics manufacture was also very much alive here in Columbia, and there are commonalities between what was being produced here in Richland County and what was being produced in the Edgefield area." Historians and researchers from Historic Columbia, the Lexington County Museum, the South Carolina Department of Archives and History, McKissick Museum, the South Carolina State Museum and the Columbia Museum of Art worked collaboratively to rethink contributions from Fall Line region artisans who have not been appreciated in this context. "The river was seen by many as an impediment," says Sherrer. "At one point of course you can get all the way up to the Columbia area and then you're stuck. You are either going to portage or you are going to end up staying right here. Because of that, in decorative arts we see that there is a kind of unique blend of the Lowcountry's sophistication with the craftsmanship of the Columbia and Richland County areas." Maybe local craftsmen here were working in walnut rather than mahogany, but many of the designs are similar to arts you might find in Charleston. "Going down toward the Augusta area, much like the Columbia area, you're still seeing a mixed bag of things," says Sherrer. "You'll have perhaps more rudimentary types of furniture, but right beside it you'll have a piece that is as finely executed as any you'd see in Charleston in terms of the overall form. Also, we had a large influx of mid-Atlantic artisans coming down South around the early 1840s to 1850s because of greater opportunities and the greater purchasing capacity of wealthy South Carolinians who had amassed great amounts of money with successful cotton harvests." Sherrer also has a fascination with antebellum artists, especially those who painted the handful of known paintings or drawings representing Columbia from the vantage point of the canal or the river. One of those artists, a French painter named Eugene Dovilliers who lived and painted in Columbia from 1840 until 1866, painted two oil-on-canvas views from the river: one of the city from the west banks of the Congaree, and another of duck hunters near a river grist mill. These works of art give historians insight into the popularity of the riverfront in antebellum Columbia. Today, geologists like Kuntz and Howard still marvel at the complexity of the Fall Line: exactly what geologic forces of nature caused it and why here? From a natural resources perspective, there are the rivers themselves and the opportunities they bring for outdoor recreation. 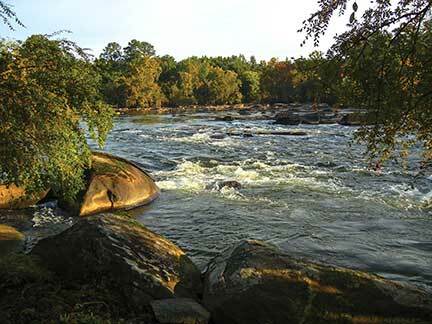 The Congaree offers great springtime striper fishing [see "River Run" beginning on page 28], while the rock-strewn lower Saluda plays host to a unique cold-water trout fishery. Parks along the rivers draw thousands of people to the Fall Line who don't know anything about the geologic significance of this particular place. 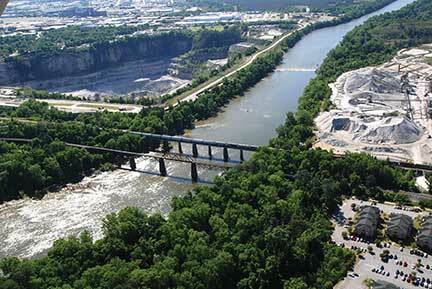 On the industry side of the coin, water from the Columbia Canal still turns generators to produce electricity, and just below the confluence, two granite quarries actively mine hard crystalline rock from deep pits on either side of the Congaree. Throughout our history, the Fall Line region of South Carolina has been a place where people from different walks of life have found a place to call home and create a unique culture all their own. While geologists like Greg Kuntz and Scott Howard work to understand the scientific mysteries associated with the geology of the region, historians and curators such as John Sherrer will continue to catalog and interpret its cultural resources, and the DNR and other agencies will work to conserve this valuable natural resource. The Fall Line was never just rocks in the river, but a blending of people and cultures - and the natural resources that shape them both.